It’s been few days since Google+ launched and 2 days since I am using it. If you pass the stupid argument that states that Google+ looks like Facebook that some like to promote and actually give it a try, you realize that Google might be onto something here. Google Plus is not about friends, it’s about people. I don’t know about you, but I can not call all my Facebook friends, actual friends. They are people I know or met at least once, but friends is a bit too much. I even refused friendship requests just because I didn’t know those people. With Google Plus I can even create a Circle of people I admire, without having to ask for their “friendship”. Keeping things private through Circles. Now I can post something that only people from a certain Circle or even specific individuals can see. Who said Wave died? It’s embedded in Google Plus. 3. Incorporating the notifications in the Google toolbar is a huge advantage. I don’t have to be in my Google Plus account to know what is going on. I can see most of the things from there when I am using any of the Google services. I can even disable the email notifications which cuts down the spam (which I did). You know what’s so good about the concept of +1? It’s international. “Like” is an English term and probably doesn’t sound so good when you translate it in other languages. But you can say +1 in any language you want, it’s still written in the same way. The user experience is very well thought out. 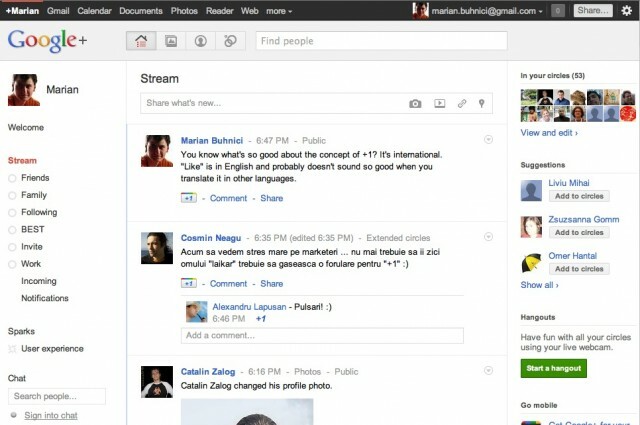 The use of HTML5 makes using Google Plus a pleasure. The cool effects you get when you drag people to a circle, or the even cooler effect you see when you delete a person or a Circle, are really eye-catching. But also small thing like making use of the full browser size for the Circles page or galleries makes the experience more interesting. Google Plus is already translated in local languages. When Facebook started it was only in English, for many years. They needed some time to translate the interface in other languages. Google made a huge step ahead by having Google Plus in multiple languages from day one. Google has a huge infrastructure and it looks like it’s making use of it when it comes to Google Plus. This is probably the biggest reason why Plus will work. With millions of people using the Google services, it makes it even easier to convert them in Google Plus users. And probably there are even more reasons that we will discover in the near future. 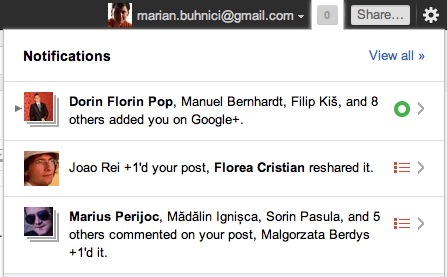 But at least for me, these 7 arguments make Google Plus a tough competitor for Facebook. After two days of using it, I already have over 50 people in my Circles, so I think people are also joining it quite fast. I’ve been waiting for over a year for the new player in Social Networking and it looks like it comes form Google, just like I was expecting. Let’s see what Facebook will come up with next week.